When I wrote about the indie bookshop week in the UK this year (link to blog), I thought it would be great to have something similar in Germany. Two minutes after my post on Twitter, a fellow blogger and disseminator told me that it already existed! It’s called WUB: Woche Unabhängiger Buchhandlungen. Apparently, someone else had had the idea before: David Mesche, co-owner of the Buchbox bookshops in Berlin, experienced the indie bookshop week in the UK and convinced more and more people to join in. So this year might not be the first German WUB, but it’s the biggest so far: 680 indies are participating (679 in Germany, 1 in Vienna in Austria). You can access a short description about the participating bookshops and their programme online (link to their website, (in German)) or just check out the #WUB hashtag on the usual social media platforms. Even though some great bookstores are excluded from the scheme (as Maria-Christina Piwowarski explained in her recent interview with us (link)), it’s still a great collection of committed people – and quite a relief to see how many indies are still doing some amazing work. The WUB is still on, so you have time until Saturday to join in. 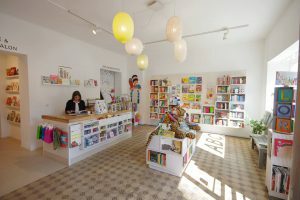 In the spirit of celebrating great indie bookstores, I would like to seize the opportunity and introduce a fantastic book place in Berlin: the independent children’s bookstore “Krumulus” in Kreuzberg. It’s a bookshop, gallery, print workshop and hub for events that might make you rather jealous of the kids who get to live nearby. Krumulus hosts a children’s reading group, concerts, puppet theatre, readings, exhibitions, Spanish, French and Italian craft sessions… I can’t even mention them all (link to the Krumulus website). The bookshop is named after the pill that Pippi Longstocking takes in order to never grow up – and the team does a lot to encourage young and slightly older visitors to remain curious and approach new things with a playful and open mind! The team members – Marisa Bihlmann, Kerstin Hanne, Anna Morlinghaus, and Sven Wallrodt – combine their skills in bookselling, pedagogy, teaching, graphic design and many more and make this a fabulous place to be. I first heard about Krumulus through my friend Meiken Endruweit, who is a freelance editor, translator and illustrator (link) and founded the “Suruklum Lesewölfe” in 2015, the bookstore’s children’s reading group. In this group, children get to discuss every month what they have read (they also get to borrow reading copies) and are encouraged to become literary critics themselves. When I asked Sven Wallrodt how their programme during the WUB differed from their usual events he smiled and said: “Actually, we’re doing what we do every day of the year: we invite great authors and illustrators who are not on the bestselling lists.” And they offer an amazing range of German and international children’s books. During the WUB, they host a shadow play adaptation of Little Red Ridinghood (“Rotkäppchen – da geht noch was“) and an afternoon with the Swedish illustrator Stina Wirsén, who found poetic images and words to talk about child neglect. The Krumulus world introduced me to such a variety of books and illustrations that I almost regained my faith in humanity. I think I even returned home skipping. When you talk to Sven, you can feel his excitement “infecting” you from head to toe. Krumulus just received a prize for the best German bookshop (“Deutscher Buchhandlungspreis”, link to the prize’s website). It is awarded to owner-run bookshops that promote literacy and literature, have a special literary selection, host cultural events or stand out because of their innovative business model. The three winners receive 25,000 Euros each, but a rather large number (up to 105) also receives some considerable prize money (7,000 and 15,000 Euros). Congratulations, Krumulus, and keep up the good work! A visit to Krumulus is my recommendation of the week – and not just for the little ones among us. P.S. : Please feel free to share stories & impressions of your favourite bookshops (via s.v.lente(et)gmail.com or @svanlente on Twitter) – we’re happy to add them.